Ismael Jimenez talks to police after a manager at the Cinemark theater at 40th and Walnut streets allegedly the cops on his family. These images are screencaptures of the video that Jimenezs wife wife recorded when police responded. 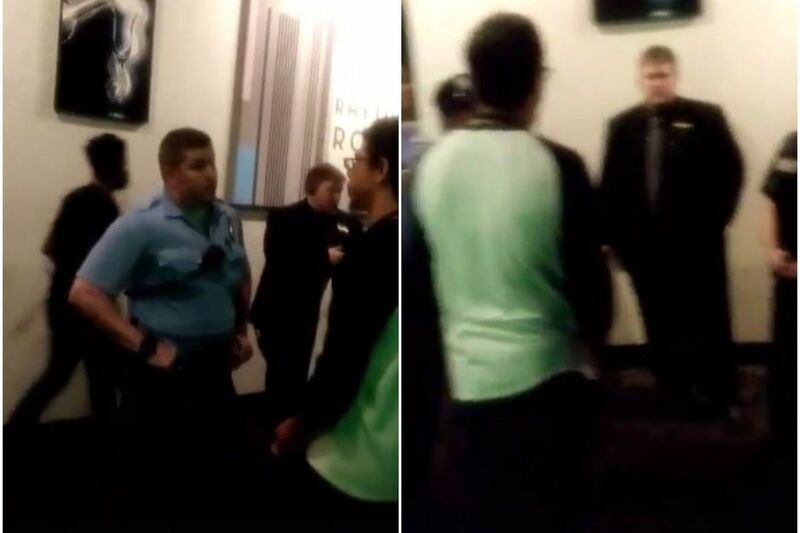 Update: Police said Thursday that a radio miscommunication caused numerous officers to respond to a West Philadelphia movie theater on June 22. "As best as we can determine at this time," the department added, "no 911 call was made by theater staff regarding the incident." The family involved said they assumed a theater manager had called 911, because the manager threatened to do so during a dispute. About 10 officers responded to the situation. Read more about how police say the situation unfolded here. A black family who attended a screening of Jurassic World at a West Philadelphia theater Friday says a manager called police on them following a verbal dispute about being able to retrieve their kids in the theater. The ensuing response — which drew at least a half-dozen officers — was captured on video and shared on Facebook, where it has been viewed more than 60,000 times. Ismael Jimenez, the father in the video, said the incident at the Cinemark at 40th and Walnut Streets fits into a broader pattern of white people calling the police on black people for seemingly minor issues. "A black person's considered a threat immediately," said Jimenez, 36, a teacher at Kensington Creative and Performing Arts High School, who lives in North Philadelphia. "So therefore, if they are defiant to you, instead of actually dealing with the issue, you are calling the police." Police confirmed that officers responded to a "disturbance" around 9:40 p.m. Friday but declined to comment further. An employee at the theater referred comment to Cinemark's corporate office, which did not respond Monday. Jimenez said he and his wife, Ashley, had requested a refund about an hour into Friday's 7:45 p.m. showing because a loud beeping noise kept going off near them, their four sons, and two of the sons' friends. The couple had left the children — except for their youngest, a 3-year-old — in the theater when they walked to the lobby to ask for the refund. The manager provided the refund but said they could not reenter the theater, Jimenez said. He and his wife protested and said they needed to get their children. The manager refused, Jimenez said, and called police when his wife went back in. One officer — who was already in the building — followed and then approached Jimenez, he said. Ashley Jimenez, who returned with the kids, pulled out her phone and started recording the encounter. "Ask us to leave, why? Because they messed up?" Ismael Jimenez, referring to the theater, told the officer. Soon more officers showed up. Jimenez said his oldest son, 11, whom he has talked to about the potential dangers of interactions with police, grew frightened and ran to the bathroom to vomit. "He was worried that I was going to get hurt," Jimenez said. As the dispute continued, a bystander in the background questioned whether so many officers were necessary. One of the officers eventually calmed the situation and helped the Jimenez family get a refund for concessions. No one was arrested. Jimenez is a member of the activist group Black Lives Matter Philly, which shared the video on its Facebook page. Another incident with racial elements in Philadelphia — the arrest of two black men at a Center City Starbucks — sparked national outrage in April. The arrest, captured on video, led to an apology from the city's police commissioner and moved Starbucks to shut all its U.S. stores for an afternoon to conduct anti-bias training. Elsewhere in the nation, videos of white people calling the police on black people performing basic activities — sleeping, barbecuing, selling water — have gone viral in recent months. In San Francisco last weekend, a white woman called police on an 8-year-old black girl who was selling water bottles. At Yale University last month, a white student called police on a black student sleeping in a common dorm room. In Oakland, Calif., in April, a white woman called police on black men barbecuing in a park. The community responded by holding a "BBQing While Black" event. And in Missouri last month, employees at a Nordstrom Rack store called police on three black teenagers and falsely accused them of shoplifting. The company's president apologized.